30-Step Minimalism Challenge Week 2 Update | Lauren, Etc. Tuesday was James and Emma’s 1st Birthday! This past year of motherhood has gone by so quickly, so it felt even more important to practice being in the moment now. I used to pride myself on my ability to multitask, but now I just feel like I was preventing myself from realizing my full potential. 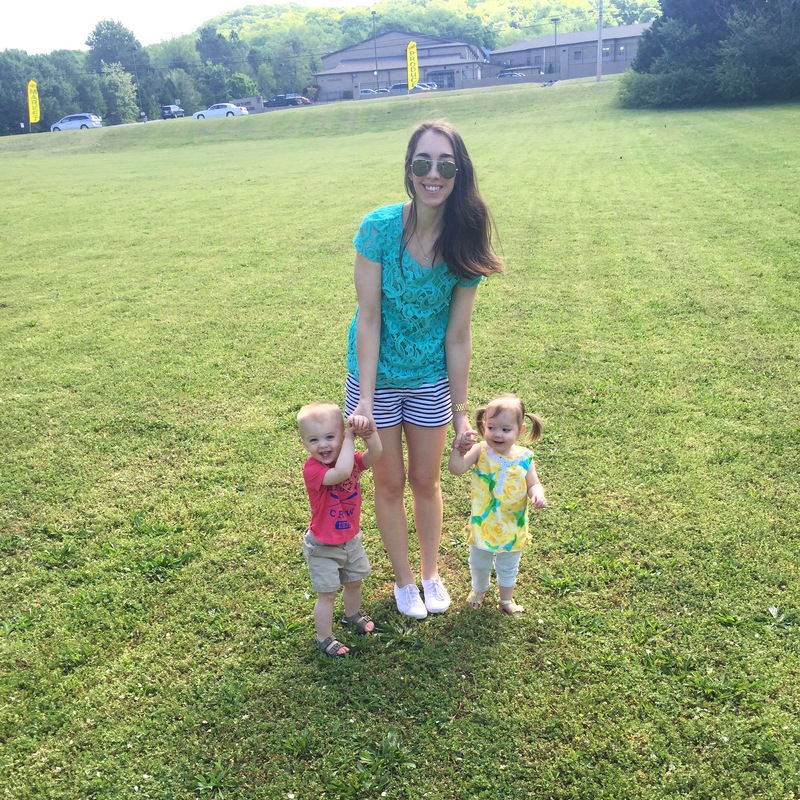 Towards the end of my time as a working mom, I realized how important it was to be focused on the present and not try to muddy the lines between work and home. This helped me to continue to excel at work and also feel like I was giving my all to my family. This day devoted to single tasking was pretty successful. The only time I completed two tasks at once was drinking coffee while I put on make up and drinking water while I drove to the grocery store. I can definitely see the value in drinking my coffee and just enjoying that experience, so I’m going to try to work that into my routine. The biggest challenge I presently have with multitasking is responding to texts and emails while I’m playing with the babies. I still bring my phone into their nursery, but just so that I can catch photos and videos of particularly cute moments. I’m lucky enough to presently have enough hours in the day to accomplish everything so I am going to continue to make singletasking a part of my lifestyle. I detailed the steps I took to create an energizing morning routine in my last blog post. I really feel like these steps are so crucial to me having a productive day. I followed these steps exactly on Thursday and even though I didn’t have much that needed to be accomplished, I found tasks to keep myself busy when the babies were napping instead of just spending my time on Bloglovin, Pinterest, and Tumblr like I normally do. I ended up burning about 30% more calories (as calculated by my Apple Watch) than I normally do in the process! I have been stressing about not having any friends in Alabama a lot lately. The last time I moved to an entirely new place was between 1st and 2nd grade. We were lucky enough to move into a neighborhood full of families with young children and I started school within 2 months of moving. I don’t even remember worrying about making friends. And now I am 28, I’ve been living in a new state for 3 months, and I still know absolutely no one. Solitude has been thrust upon me, so I’m going to have to learn to enjoy it whether I like it or not. For the purposes of this step, solitude is not being around people outside of my immediate family; I don’t have the luxury (nor would I want to) spend a day completely away from my husband, babies, and dog babies. I used this day to focus on all the positives that come with solitude. My children are my focus so I don’t have to worry about spending time away from them or doing things they might not particularly enjoy because we’re obligated to. I’m also saving a ton of money by having no social life. Shopping with friends, grabbing a frozen treat, and going to the movies probably cost me an average of $100/week. That puts us $4800 closer to owning a home! Solitude also negates the effects of “keeping up with the Jones”; when you have no one to compare yourself with, you have more time to be happy just being you. This step in the challenge was pretty easy to accomplish, and, in my particular situation, I don’t feel it effected me positively. I’m already a lazier, unmotivated version of myself in the present, so having some semblance of plans is good for me. I think six months ago, this day would have been really go for me. But for now, I am going to continue to start the day with plans and goals in mind. At the beginning of this challenge, I devoted a day to going make up free. But I didn’t really do anything outside of that. I stayed in my loungewear and only went outside to walk the dogs. That didn’t really get me outside of my comfort zone. So I decided to repeat this step on a day when I would normally want a little coverup. At first, I thought “oh, I’ll just stay in my gym clothes while I run errands”, but that, in itself, is a comfort zone. It makes sense to be make up free and not dressed up. Instead, I got dressed in a cute maxi dress, put some beachy waves in my hair, and wore nothing, but SPF on my face. I felt genuine and confident while I was running errands. Normally, makeup free Lauren has on sunglasses and a baseball cap, but this version smiled and said “hello!” to everyone she met. However, at the end of the day, I looked in the mirror, and I was not happy with the reflection. I had a couple new pimples, my pores looked bigger than usual, and my skin was super oily. I still have a long way to go before I truly feel confident without make up, but I’m glad I completed this step nonetheless. Before heading to the grocery store, I cleaned out the fridge and pantry. I actually complete this step on a pretty regular basis so it was not too difficult or eye opening. I did learn that I need to get into a regular schedule of prepping snacks and some meals ahead of time. I allow so much food to go bad when I forget about it in the crisper or it gets pushed to the back of a shelf. I’ve been challenging myself to only purchase enough food for one week at a time to help with this initiative. I still buy some items like rice, quinoa, and honey in bulk. But I am learning to resist bulk meat and produce purchases. I took some time on Sunday to also plan out the rest of the steps in the challenge. I am really looking forward to creating my bucket list, reading list, and relaxing bedtime routine. I am not looking foward to organizing my digital life, but that the thousands of baby photos on my phone and laptop need to be backed up already. Let me if you are in the process of completing a minimalism challenge or you have completed one in the past! I would love to hear what you’ve learned through the experience.